Matthew Bink has sealed the inaugural Boost Mobile Supercars e-series, with one round of racing still to come. Bink, who competes as MadRacer38, has been the driver to beat from the outset, winning the very first race at Laguna Seca on October 16. He started Tuesday night's fifth round having won six of the 12 races and finished 10 on the podium. That gave Bink a 48-point championship lead entering the penultimate event, which he duly extended to 58 to put his advantage beyond reach. While 60 points are on offer in next week's final, even failing to finish all three races would give Bink six points based on Forza Motorsport's scoring system. The 22-year-old Victorian wins the major prize of $2,000 cash and a $500 Harvey Norman gift voucher. "I had no idea," Bink said of winning the title in the Abu Dhabi race. "I didn't see where Adrian [Yalpi, closest rival] finished. Oh my god, that's cool. "I've still got to race hard [next week] and give everyone a fight." 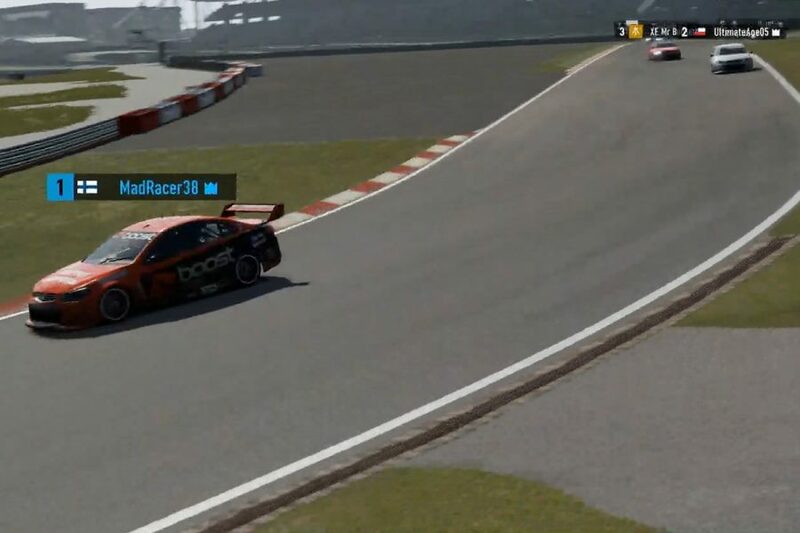 Bink qualified fifth for Tuesday evening's opening race on the Nurburgring Grand Prix layout but swept into the lead on the first lap and went on to win. The reverse-grid heat on Forza's bespoke Rio de Janeiro street circuit did not feature a pitstop, with Bink having to settle for fifth, his lowest finish of the campaign. That still gave Bink a front-row start for the Intercontinental Leg's final sprint, at Yas Marina Circuit, which he converted into an eighth win from 15 races. He took the lead into the first corner and finished lap one with a comfortable advantage thanks to a fierce fight behind. "It wasn't a breeze but everyone crowded the apex at Turn 1, so I went to the outside and hoped for the best," Bink said of his opening lap at the Nurburgring. "I managed to skip through, which made the race. "[Abu Dhabi] was a surprising race, it ended up being quite a big gap early on." It took Bink to 252 points, 58 clear of Adrian Yalpi (UltimateAge05), who finished second in Races 1 and 2 to secure pole for the final. Yalpi had to settle for fourth in a frenetic Abu Dhabi race, as Mark Pretty (XE Mr Bucket) and Andrew Dyson (Ssemper) rounded out the podium. Dyson started the evening second in points to Bink but fell to third with results of fourth, seventh and third. In the fight for second, and $1,000 cash, Yalpi and Dyson are split by 12 points. Pretty enjoyed his strongest evening to date, taking pole in Germany and finishing third, third and second. With those results, he closes to within four points of fourth-placed Jacob Harvey (Har05) in the standings. Harvey swept from fourth to first on the opening tour of Rio's eight-lapper, a lead he didn't surrender. Having been fifth in the opener, Harvey then picked up a 2.5-second penalty in Abu Dhabi for an early clash that demoted him from sixth to eighth. 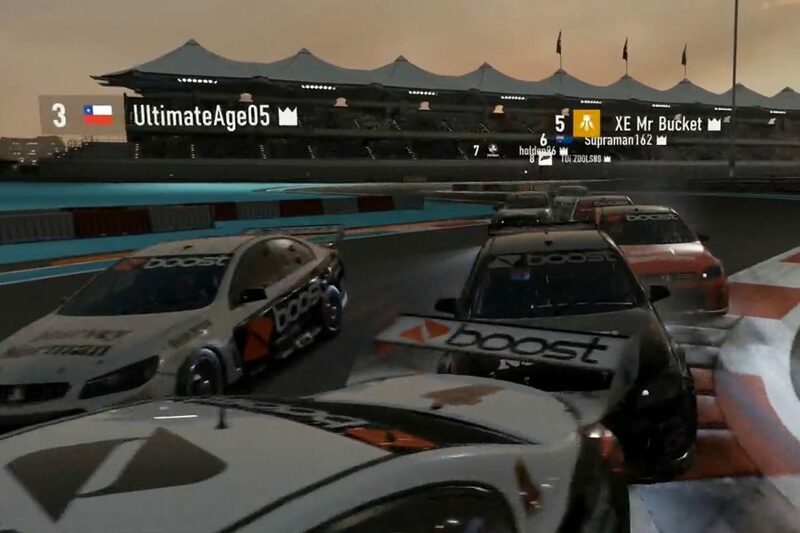 The Boost Mobile Supercars e-series concludes on Tuesday November 20 with races at Suzuka, Monza and Bathurst. Open to all comers on Xbox's Forza Motorsport 7, the Cup Series continues with races on Wednesday and Monday evenings.